I can’t recall any Australian boxer, other than Jeff Fenech, Kostya Tszyu, and Johnny Famechon, that captured the hearts of people Down Under as did Les Darcy; he was the first. Born in Woodville, New South Wales, on October 31, 1895, he began his boxing career as an amateur at the young age of fifteen. A year later, in 1910, he began a outstanding professional career. 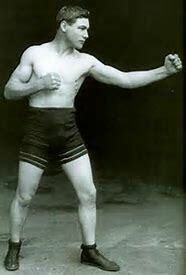 He won his first sixteen fights before challenging a seasoned veteran, Bob Whitelaw, for the Australian welterweight title in 1913. Darcy lost a twenty-round decision but, in a rematch the following year, he knocked out Whitelaw in five rounds. After the knockout win over Whitelaw in 1914, Darcy lost twice to Fritz Holland, one by twenty round decision and the other on a disqualification in the eighteenth round. In 1915, Darcy fought Jeff Smith for the Australian middleweight title, losing to Smith in a controversial bout. Darcy complained of a low blow at the end of the fifth round; the referee believed that Darcy did not want to continue the fight and awarded the bout to Smith. In the rematch a month later, Darcy was awarded a victory to win the title after Smith hit him with a low blow. 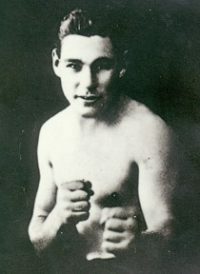 Darcy would not lose another fight in his career, posting a ring record of 46 wins and 4 losses, with 29 wins by knockout. He faced all of the top contenders and on February 19, 1916, fought Harold Hardwick in Sydney to win the Australian heavyweight title. He would have the distinction of holding both the middleweight and heavyweight Aussie titles simultaneously. In 1916, Darcy fought and won ten fights, all but two by knockout, which was a banner year in defending his two title belts. In early 1917, while World War I was in full force, Darcy had failed to enlist in the allied Australian military. This caused him to be looked down upon in the eyes of the general public. He fled to the United States by stowing away on a oil tanker bound for New York. Once in America, he was labeled by the press and others as a “slacker” in their opinion, and was denied a boxing license to fight. In desperate need, Darcy signed an oath of allegiance to the United States and joined the armed forces, with the intent that he would be granted furlough leaves to fight. Sadly a few days later on May 24, 1917, at the age of twenty-one, he collapsed and died in Memphis, Tennessee of blood poisoning from an infected tooth. Darcy was inducted into the Ring Magazine Boxing Hall of Fame in 1957, the International Boxing Hall of Fame in 1993, and the World Boxing Hall of Fame in 1998. Darcy had a hell of a career. Lionel Rose captured the hearts of our nation, like no one else had since Darcy.